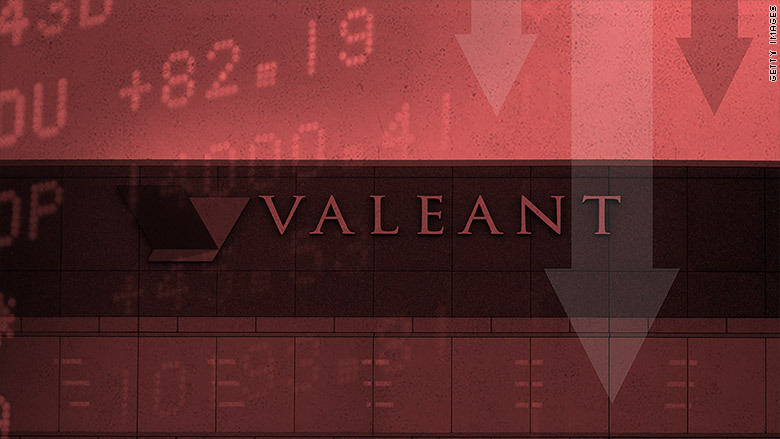 Valeant Pharmaceuticals is experiencing its worst day ever. Valeant (VRX) stock lost nearly half of its value -- 51% to be exact -- on Tuesday after freaking investors out about a possible default. The controversial Canadian company slashed its guidance and warned that if it fails to file a key annual report by April 29 it would violate an agreement with creditors. Such a violation would allow Valeant's lenders to declare a default and demand their money back sooner than originally planned. Valeant said it's "working diligently" to file the annual report, known as a 10-K, "as promptly as reasonably practicable." However, Valeant said it is also working with lenders to get the deadline pushed back. "Uncertainty about the potential for a default creates enormous investor fear," said Bill Ackman, the well-known hedge fund manager who is also a major Valeant shareholder. It's the latest trouble for Valeant, which has become the focal point of anger over dramatic drug price hikes that's taken place at some pharmaceutical firms. In fact, Valeant sharply downgraded its outlook for first-quarter profits in part due to the "cancellation of "almost all price increases" amid a flurry of legal scrutiny. The company also admitted that the transition from its controversial mail-order pharmacy partner Philidor to Walgreen (WBA) had been rocky. "Our business is not operating on all cylinders," Valeant CEO J. Michael Pearson told analysts during a conference call. Pearson, who recently returned from a medical leave of absence, said Valeant is "committed to getting it back on track." Valeant stock has plummeted to $33.51, an incredible 87% decline from an all-time high of nearly $264 in August. The trouble began last fall when federal prosecutors started investigating the way Valeant prices and distributes its drugs. Things got even worse in October after a research firm betting against Valeant's stock accused the drug company of Enron-like fraud. The firm, Citron Research, specifically accused Valeant of an improper relationship with Philidor. Ackman, the major Valeant shareholder, acknowledged that the recent issues have caused investors to "lose total confidence in the company" even though he was a believer. Valeant's board has formed a special committee to investigate the Philidor relationship and the company recently said it will likely need to restate past financial results due to issues with Philidor. Today Valeant faces countless investigations, including ones from Congress, the Securities and Exchange Commission and the U.S. Attorney's offices for Massachusetts and the Southern District of New York. Valeant said it is cooperating with these investigations and is providing documents and testimony authorities have requested.